Zaw Zaw's story of being a Burmese worker enslaved on a Thai fishing boat is extreme, but not unusual. He is one of thousands of young men trafficked into Thailand's fishing industry, which is one of Britain's biggest suppliers of fish. The 26-year-old spent only three months on board before he escaped, but in that time saw three men killed, watched the captain lace the drinking water with drugs and was forced to work around the clock. It began as he joined a group being smuggled illegally from his home in Burma through the jungle into Thailand with the promise of a job in a local market or factory. "On the way, two of the Burmese women were raped by the Thai broker and then they started to beat us," Zaw Zaw said. They were passed from broker to broker and locked up before being sold to a fishing boat - he didn't know it, but they were being trafficked into what human rights activists describe as slavery. If the men became sick they were beaten, they were never allowed more than a few hours sleep at a time, and were living under threat of violence or even death. Zaw Zaw described the desperate measures some would go to in order to get away. "Three men tried to escape at 2am. They grabbed fishing net floats and jumped in the sea, but it was very rough and two drowned as they couldn't swim. The other was caught when he got to shore. "They brought him back to the boat - his face swollen from being beaten and tortured. They called us all on deck and the Thai captain said this is what happens if you try to escape. "The man was tortured with electric shocks and was then shot in front of us all and thrown overboard." They slept in wooden bunks only just big enough for them. Zaw Zaw said they were like coffins and so small that when the bell was rung for them to work - every few hours - those new to the boat would bang their heads when they were woken suddenly. "I saw the captain put 15-20 amphetamine tablets into a plastic bag and crush them into a powder and then put that into the drinking water. We worked faster and faster but then had terrible headaches afterwards." After seeing three men killed Zaw Zaw realised it could happen to him and so, despite the risks, decided to escape. "When the fishing boat was anchored near the shore I took a float and jumped into the sea at 1am. I reached the shore at 6am - the sea was very rough. "I got through the sand dunes and then hid in bushes. They were searching for me and walked right in front of me but never saw me - I thank God for that." After walking four days he reached Pattaya city, found a church group which could help him and now he is legally living and working in Bangkok, and helping others who are trying to escape. He was paid nothing for the work he did. We spoke to many Burmese men now in Thailand who described similar stories - the trafficking, the beatings, the killings. 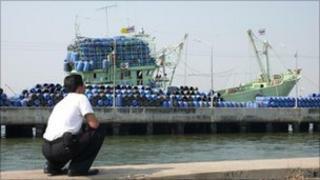 They estimate there are thousands of Burmese workers aboard Thai vessels. They told us some workers were kept on fishing boats for years without seeing the shore as the fish were delivered on to bigger boats which would take the catch to the docks. Mahachai is one of Thailand's bigger fishing towns, with fishing boats coming in early every morning. A dock official, who did not want to be named, said the boats are all run in a similar way, with a Thai captain and engineer, but with illegal Burmese workers making up most of the 20 crew. And it's not just on board ship - illegal workers are trafficked to packing and processing factories as well. Ka Oo was 18 when he arrived in Thailand: "I wasn't allowed to leave the factory for four years here and worked 15 to 20 hours a day. It was like living in a prison." He eventually escaped by getting hold of a mobile phone, banned in the factory, contacting a friend to arrange to be picked up and then climbing over a huge wall to get away. The Thai authorities say they cannot comment on individual cases, but insist laws are in place and they are doing what they can to stop the abuses and to regulate Thailand's fishing fleet, which is one of the biggest in the world. But human rights activists say more could and should be done to stop this. Andy Hall works with a human rights group for Burmese migrants in Thailand. "Many people are being tricked into going into the fishing industry so the people are literally like slaves and kept on the fishing boats," he said. He believes people in Britain and around the world should be aware of what they are buying. "What we would say is when you buy your fish, and that fish comes from Thailand, it's coming from an industry where there is a gross exploitation of people who are trafficked into the industry, who are working such long hours in inhumane conditions. "The people who are receiving this fish need to be demanding that the Thai government regulate the fishing industry and ensure that the exploitation is reduced, because at the moment it is a very serious problem."